Tucked between the exodus of students at the end of the academic year and before the hum of the summer programs, May 23 started as a slow day. Things got considerably more interesting when curators from the Boston Museum of Fine Arts accompanied by Brandeis professors, visited HBI’s Kniznick Gallery Exhibit, Tamar Paley | A Fringe of Her Own: A Collection of Ritual Objects for Women. That day kicked off a journey that saw the MFA’s acquisition of three pieces from the 28-year-old Paley’s collection in her first American exhibition, a notable accomplishment for an artist at any stage of her career. It was also a first for HBI, the host of 11 prior exhibits that showcased artists whose work represented HBI’s mission of fresh ideas about Jews and gender. “The HBI exhibition has been an amazing career starting point, an experience that led to opportunities and growth that otherwise I probably would not have achieved this early in my professional life,” Paley said. The timing, it turns out, was not a coincidence. Earlier that year, the MFA, in an effort to boost their Judaica collection, hired new curator from Israel, Simona Di Nepi, now the Charles and Lynn Schusterman Curator of Judaica. Di Nepi joined colleague, Marietta Cambareri, Senior Curator of Decorative Arts and Sculpture and Jetskalina H. Phillips Curator of Judaica. 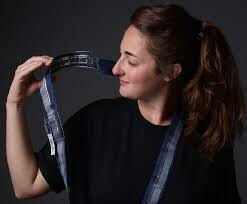 Paley, a jewelry artist who lives and works in Israel, focused on a complete reimagining of three basic Jewish ritual objects: tzitzit, tallit and tefillin, typically worn by men. Tefillin, traditionally seen as dark leather straps around the arms and head were transformed into sacred jewelry, beautiful silver cuffs, holding prayers that are meaningful to women and delicate necklaces that put the prayer close to the heart. With a growing need to provide a feminine interpretation of patriarchal religious practice, Paley’s work offered a reshaping of traditional patriarchal forms from using materials, text, and symbolism that acknowledge the physical and spiritual experiences of women in Judaism. Di Nepi explained, “Contemporary Judaica is a key area of the MFA Judaica collecting plans. The fact that these Judaica objects are made by a young woman is significant in itself, as it shows that Jewish ceremonial art is not merely something of the past, but is actually occupying the minds and time of young artists.” The MFA acquired A Sign Upon Your Hand arm bracelet, Hamavdil neckpiece and Between Sacred and Not pendant. HBI selected Tamar Paley as the 2018 artist by a jury comprised of the directors of HBI, the Kniznick Gallery curator, Susan Metrican, and members of an Arts Advisory Board. Each fall, HBI accepts exhibition proposals through an open call that seeks work that speaks to HBI’s mission. The opportunity provides selected artists with a four-month exhibition at Brandeis University at the Kniznick Gallery, along with exhibition support, public programming, and an exhibition catalog. “We are thrilled to see MFA recognize this important art and the ways that it showcases HBI’s support of research and creativity at the intersection of Jewish studies and gender studies,” said Lisa Fishbayn Joffe, the Shulamit Reinharz Director of HBI. HBI’s next exhibit, One Foot Planted | Ayelet Carmi & Meirav Heiman, opens Thursday, February 28. Through video works, it explores the impact that politics and conflict have on Israeli women in times of crisis. 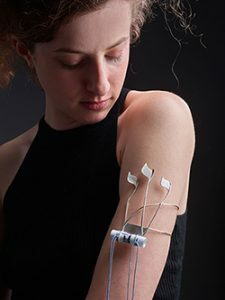 Both the ritual of processing the Israel Trail and counting the Omer become ungendered and labor-intensive sites of communication between bodies, land, machines, and the movement of time itself, explained Metrican. To prepare Paley’s art for delivery to the MFA, Metrican turned to the Brandeis archivists for assistance. Surella Seelig, Outreach and Special Projects Archivist, wrapped the work carefully, using special paper and boxes. Then, HBI delivered the work to the MFA’s basement staff entrance where we met with the appropriate staff who accepted the work. MFA staff explained that the work would be reviewed by experts in textiles, metals and other areas as it was accessioned. In 2013 the MFA acquired the Charles and Lynn Schusterman Collection, a transformational gift of Judaica comprising 120 decorative and ritual objects. Now, the Museum’s holdings of Judaica feature pieces from the 18th through the 20th century from Europe, North Africa, Asia, Israel, and America — including metalwork, works on paper, textiles, ceramics, sculptures, and paintings. Schusterman also supported the gift of objects with funds for conservation, documentation, photography, and display. Di Nepi noted that while Paley’s work is not yet on display “we are already using her collection for students’ visits and discussions about feminist Judaica,” including a recent visit from Brandeis students.